These are some examples of the early round nose hydros. They were often referred to as shovel nose. We have different models based on both the Jones and the Carlson originally designed race boats. There are subtle differences. Call us for more details. The first pickle forks were developed with the driver sitting at the rear behind the engine compartment. The Pay&Pak is a classic racer. This is a 1/8 scale model. We also produce a very popular Rigger Model. No collection is complete without a latest generation model. They feature modern picklefork design with forward driver cockpits and enclosed canopies. 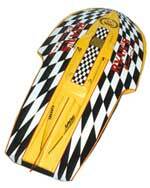 We have models based on the Bud Racing Team, and the Winston Eagle. Both are real eye catchers.